A young craftsman brings his expertise in woodworking and custom cabinetry to his 'mini mansion,' which he insists has a full-size bedroom, walk-in shower, handcrafted wine storage and a spacious linen closet. This tiny house is sure to not disappoint when it comes to luxury and style! 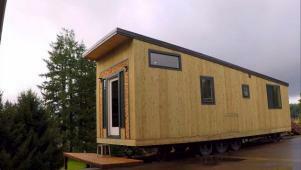 A young woodworker builds his tiny home with a full-size bedroom and bath.